Handmade Detroit | Who doesn’t love the Tigers?! Who doesn’t love the Tigers?! Here is my entry for the Craft Stitch N’ Pitch Contest! It is a folder for organizing and traveling with any small needlework project. The knit cover is made from Rowan Wool Cotton, including a duplicate stitch Old English “D”. All the pockets are hand-stiched as well. 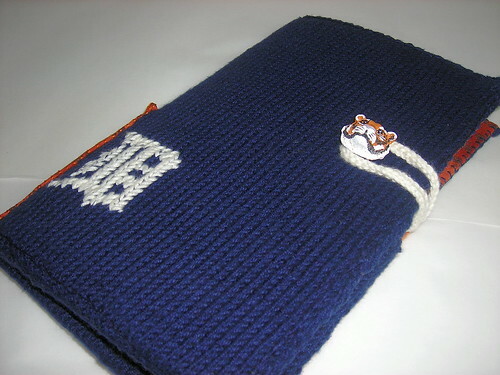 The inside cover features a paw print pattern that coordinates perfectly with the tiger face button closure and overall Detroit Tigers theme. 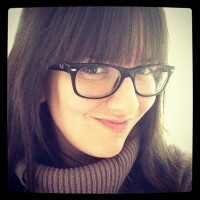 She was kind enough to let me repost this photo, so shoot her some love back by checking out her entire Flickr set on the project.